This 5-2 diet recipe for Steamed Fish uses one of the simplest ways to cook healthy food. Steaming fish involves no added fat but allows you to add seasoning in the form of ingredients cooked in the steamer. What a great concept for the 5-2 diet fast days when you are really trying to keep your calorie count down! But for me it’s always brought back memories of childhood and being unwell. My mother was a nurse and had learnt ‘invalid cookery’ as a student nurse. For her, that seemed to involve a lot of eggs, steamed fish and chicken and not much else! Definitely no added spices because they might upset a delicate tummy. But of course, you CAN steam fish with various flavours and if it is done carefully, the steaming helps to preserve the very delicate taste of the fish and the marinade is a subtle enhancement. So, worth a try for the 5-2 diet I think. And worth using to showcase the lovely scottish fish from Delish Fish! 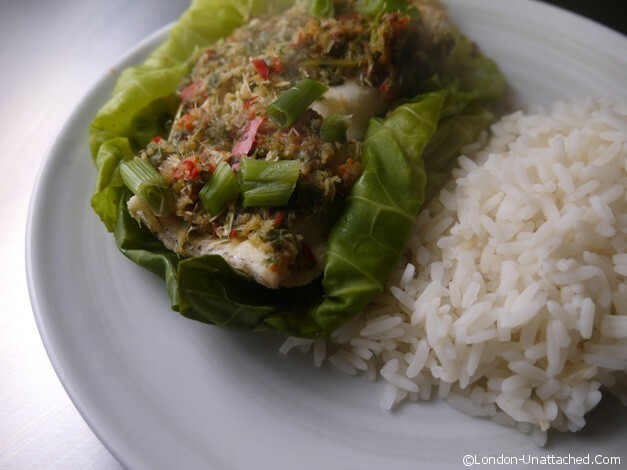 My first demonstration of steamed fish uses cabbage leaves and a Thai inspired marinade. The cabbage is simply to protect the delicate fish from the heat of direct steam and personally I don’t like the taste of the steamed leaves, though I’m not sure you are supposed to eat them anyway! If they’d been available I might have used banana leaves. And, you can substitute foil if you prefer, although it’s not so pretty. You can use any kind of steamer for this; I do have a double pan one, but I thought it was a little too large for one portion. Cheap bamboo steamers are also available from chinese supermarkets and will work well for this type of dish. The end result is a very light fish dish. You can adjust the marinade ingredients, taking out the chilli altogether if you don’t like heat. 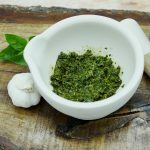 I’m planning on trying a different marinade next time, with chopped rather than blitzed herbs and spices and perhaps with something like sesame seeds added at the end for crunch. It’s very important not to overfill your steamer with water and to simmer the water. Your aim is to ensure the water doesn’t touch the fish! Put the steamer in the pan and line it with cabbage leaves. Although you will serve the fish in the leaves, they are not particularly pleasant to eat because they will be very overcooked - so you may wish to discard them! Once the fish is marinaded,lift it carefully out of the marinade and place on the cabbage leaves with the spring onion scattered on top. Put the lid on the pan. So, no longer relegated to invalid cookery, steaming is a great way to keep flavour and avoid drying out the fish or meat without adding fat. And as such a perfect recipe for 5:2 diet fast days – the calorie count for this cod dish is little more than the weight of the fish and the rice added together – about 220 calories. My 5-2 diet fast day today was this, which I ate with some stir fried cabbage (80 cals) plus some home made soup at lunch time. Really not a difficult way to keep to under 500 calories! If you are wondering where the stir fry is in the picture, one of my tricks on 5:2 diet fast days is to use a slightly smaller than normal plate. That means if I try adding in vegetables I end up with an overcrowded plate for photography! Worth trying though, for some reason I always think I’m having a full plateful of food on 5:2 diet fast days even though it’s actually about 3/4 of the size of my ‘normal’ full plate! this might be better with a dash of Tabasco! This sounds a delicious way to have fish! I love Thai flavours, I can’t wait to try this! I love steamed fish. Even simple additions like lemon and cracked pepper taste awesome the key is not to overcook it. I think I’d have to substitute out the marinade as you suggested. Thai food is normally a little hot for my taste.